Amenities-packed ballparks draw lots of fans and families. He’s a Fort Wayne guy, but he’s seen nothing like this. On this blue June evening he leans on the railing and looks out across an expanse of billiard-table green, looks at the players soft-tossing and the fans filling up the concourse and reserved seating and outdoor cafes beyond left field. And something almost like a sigh comes out of him. “Beautiful ballpark,” he murmurs to the guy standing next to him. And then he turns his head and says he used to go to ballgames at the old Memorial Stadium all the time, but this is his first visit to Parkview Field, the 8,100-capacity downtown home of the Class A Midwest League Fort Wayne TinCaps. The View, as some call it, has stood at the corner of Ewing and Jefferson streets since 2009, and it was just voted the top Class A venue in America by Baseball Digest. And, to this first-time visitor, it’s all that and more. 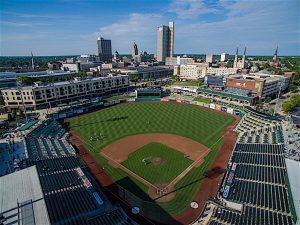 “BEAUTIFUL BALLPARK” The 8,100-capacity Parkview Field is home to the Fort Wayne TinCaps. He’s not the only one enthralled by the place. In his spacious office, where framed newspaper headlines hang alongside a big-screen TV tuned, this night, to the U.S. Open golf tournament, Team President Mike Nutter leans back and grins. With obvious relish, he recalls the times when the TinCaps brought in former big-league stars to sign autographs, and how, to a man they were left slack-jawed by the place. “Every one of them said ‘They didn’t make these when I was in A ball,'” Nutter says. No one did. But the exploding value of teams in the major leagues trickled down to the minors, where moguls with deep pockets, but not deep enough to buy–say, the White Sox or Cubs–decided to invest in the minors instead. In turn, fans whose big deals had priced them out of the major-league market, found in the minors a cheaper way to get their baseball fix. And the minors experienced their own boom. And so now there are facilities like Parkview Field–Single A venues with Triple A amenities–everywhere. And perhaps most noticeably in the Midwest League, which drew more fans (4,233,904) last summer than, not only all other single-A leagues, but every double-A league as well. Parkview Field, for instance, drew 5,971 per game, more than 26 Double A and 11 Triple A teams. And in South Bend, the Cubs drew 5,039 per game to Four Winds Field at Coveleski Stadium, which recently underwent five years of renovations that replaced the artificial turf with natural grass, added a 17,000-square-foot training facility and spiffed up the amenities with a 360-degree concourse, a Fun Zone and a couple of picnic/beer gardens. Money well spent, judges South Bend Cubs’ President Joe Hart. Parkview Field, for instance, has its own kids’ area beyond the left-field corner. There’s lawn seating beyond center field, whose $5 price tag is popular in particular with young families. There’s The Harrison, a great wall of apartments looming over left and center whose ground floor is taken up with, among other businesses, an Irish pub and a wine/tapas bar incorporating outdoor seating that overlooks the field. Nearly 8,000 fans will pour into all of that this night, drawn by perfect weather, an appearance by the ZOOperstars and postgame fireworks. The previous night they also had fireworks, after which 650 Boy Scouts bedded down on the field for the night. It’s all part of a multi-use approach that attracts not just fans, but the majors. And how bright they are these days.